Quick overview One of the world's leading authorities on war and international politics synthesizes the vast history of strategy's evolution in this consistently engaging and surprising account of how it came to pervade every aspect of life. 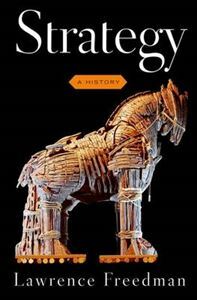 In Strategy: A History, Sir Lawrence Freedman, one of the world's leading authorities on war and international politics, captures the vast history of strategic thinking, in a consistently engaging and insightful account of how strategy came to pervade every aspect of our lives. The range of Freedman's narrative is extraordinary, moving from the surprisingly advanced strategy practiced in primate groups, to the opposing strategies of Achilles and Odysseus in The Iliad, the strategic advice of Sun Tzu and Machiavelli, the great military innovations of Baron Henri de Jomini and Carl von Clausewitz, the grounding of revolutionary strategy in class struggles by Marx, the insights into corporate strategy found in Peter Drucker and Alfred Sloan, and the contributions of the leading social scientists working on strategy today. The core issue at the heart of strategy, the author notes, is whether it is possible to manipulate and shape our environment rather than simply become the victim of forces beyond one's control. Time and again, Freedman demonstrates that the inherent unpredictability of this environment-subject to chance events, the efforts of opponents, the missteps of friends-provides strategy with its challenge and its drama. Armies or corporations or nations rarely move from one predictable state of affairs to another, but instead feel their way through a series of states, each one not quite what was anticipated, requiring a reappraisal of the original strategy, including its ultimate objective. Thus the picture of strategy that emerges in this book is one that is fluid and flexible, governed by the starting point, not the end point. A brilliant overview of the most prominent strategic theories in history, from David's use of deception against Goliath, to the modern use of game theory in economics, this masterful volume sums up a lifetime of reflection on strategy.